Neng Thao had a bright future ahead of him, set to graduate high school with top honors and heading to UC Berkeley in the fall. But it was all tragically cut short. FRESNO, Calif. -- Inside Neng Thao's home, his parents are heartbroken and reeling from the pain of losing their youngest son. Outside of the memories, pictures are all that are left of the Edison High School student who drowned in the San Joaquin River Saturday. 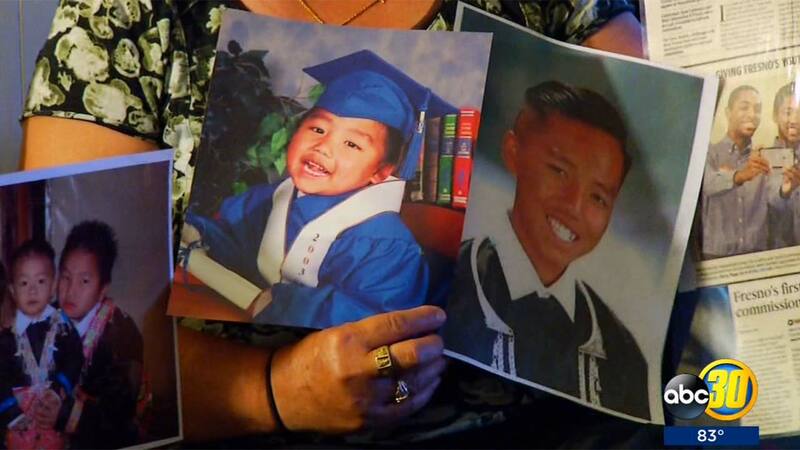 Neng was celebrating his brother's college graduation when he was swept away in the river, and he was supposed to graduate at the Save Mart Center in just two weeks. He was valedictorian of his graduating class with an over 4.0 GPA., but now his class is preparing to say goodbye to him in a more permanent way. "I love my son very much," Neng's mom Cheryia Thao said. "I need my son to come back." "I will remember my son all my life until I die," his dad added. As they mourned the day after the tragedy, Neng's loved ones worked in the front yard by making paper gold money as part of the Hmong funeral tradition. It's a tradition Cha Thao says he never imagined carrying out for his little brother. "He's the funniest guy," he said. "Most talkative kid out of the siblings and this house will not be the same." Neng's life ended abruptly while swimming in the San Joaquin River Saturday. A two-hour river rescue ended when the 18-year-old was found with the help of a fisherman. Neng was submerged in about 20-feet of water. And his close friend Bonny Her is still in shock. "It's just accepting it, you know," she said. "That he's not here no more. It's just so hard to accept." His best friend Joseph Xiong feels the same way. The two were supposed to walk together at graduation. "I will be walking by myself physically, but as corny as it sounds, he'll be there in spirit with me," he said. "And he'll be saying, 'Joseph we made it.'" And though the high school valedictorian will not get the chance to wear his mother's handmade stole or study pre-med at UC Berkeley to become a pharmacist. His parents say he left this earth while making a difference and his legacy will not end with his death. The family right now is working on funeral arrangements. The school district is also planning to honor Neng's life at the graduation ceremony on June 5.